The aurora has been lighting up our skies a lot in recent nights, in a great sweeping arc across the northern sky. It’s been a good week or so for Northern Lights, with several nights in a row of fine displays. These images are from one night, taken near home in southern Alberta, on September 2. The lead image at top shows the display at its best, with the arc of curtains reflected in a nearby pond. The green curtains fade to shades of magenta as they tower into the high atmosphere, as one process of glowing oxygen giving off green light transitions to another emitting red light. A 180° panorama of the Northern Lights exhibiting classic concentric ars across the north, with an isolated arc to the east at far right. This is a stitch of 10 segments, each 2-second exposures with the 20mm Sigma Art lens at f/1.6 and Nikon D750 at ISO 3200. Stitched with PTGui. A little later the curtains had changed form, into a more homogenous arc above a set of sharper curtains below that are farthest north. People in northern Alberta or the Northwest Territories would have been seeing these curtains dancing above them. What we are seeing is the classic curving arc of the auroral oval, the ring of light created by electrons raining down into our atmosphere in roughly an oval sweeping across the continent and centred on the magnetic pole in the Canadian Arctic. However, at right, you can see a odd detached bit of more southerly aurora, with a dominant red colour. 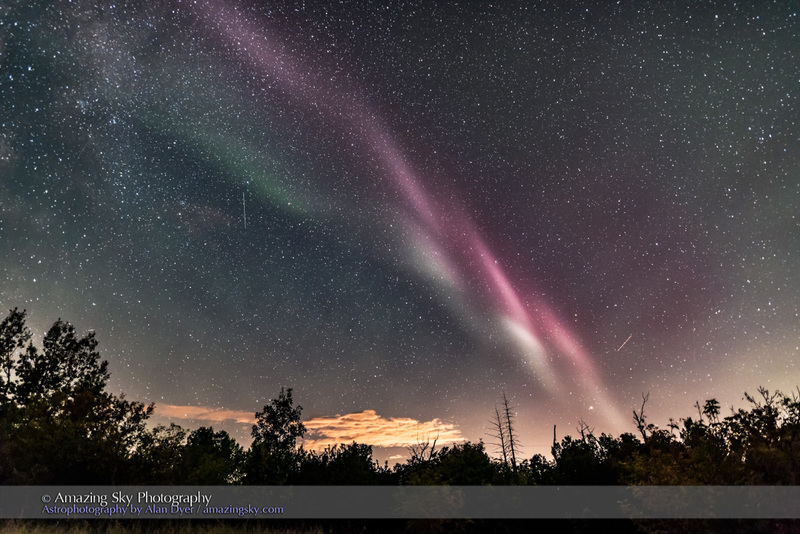 An isolated auroral arc to the east on September 2, 2016, shot from near home during a fine display with active curtains to the north at left. A single 8-second exposure with the 20mm lens at f/1.4 and Nikon D750 at ISO 3200. This is a closeup, showing the characteristic form of these odd “isolated arcs” — usually featureless, often thin, without much motion, and often red. An isolated auroral arc to the west on September 2, 2016, shot from home during a fine display with active curtains to the north. A single 13-second exposure with the 20mm lens at f/1.4 and Nikon D750 at ISO 3200. Later, the arc had brightened and expanded to cross the sky. 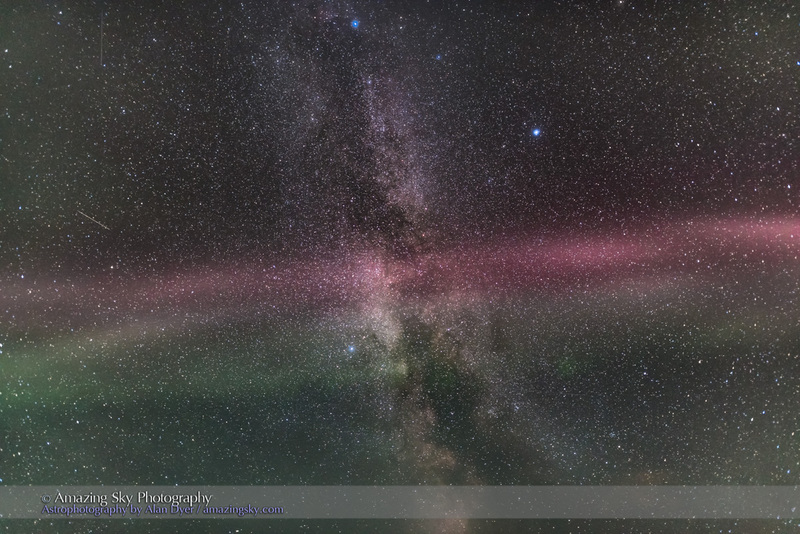 The above view is looking west from home, with the arc now displaying a mix of pink, white and green. An isolated overhead auroral arc on September 2, 2016, shot from home during a fine display with active curtains to the north. The Summer Triangle stars stand out here due to high cloud fuzzing their images. A single 13-second exposure with the 20mm lens at f/1.4 and Nikon D750 at ISO 3200. Here, we are looking up the isolated arc, with the impression of it being a thin sheet seen at an angle, with the bottom green component being closest and the red top being highest and farthest away. An isolated auroral arc to the southeast on September 2, 2016, shot from home during a fine display with active curtains to the north. 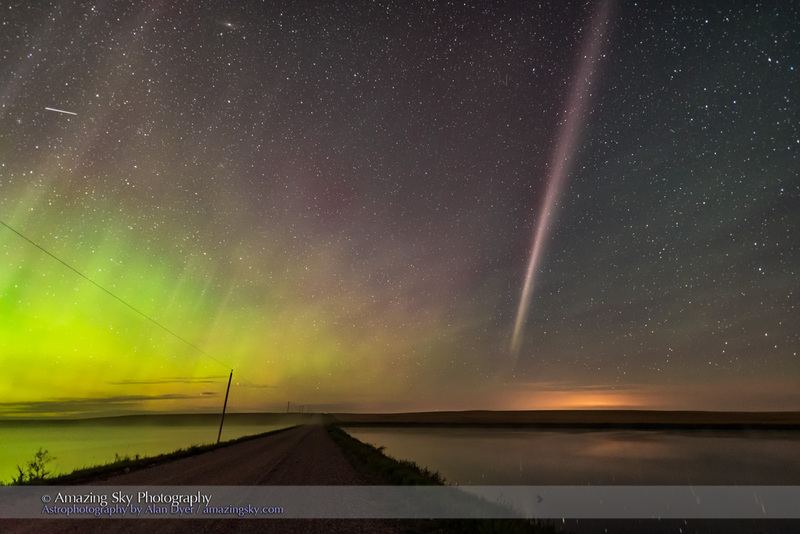 This one displays the classic picket fence apperarance, with fingers of green aurora that moved along the band during a time-lapse of the scene. 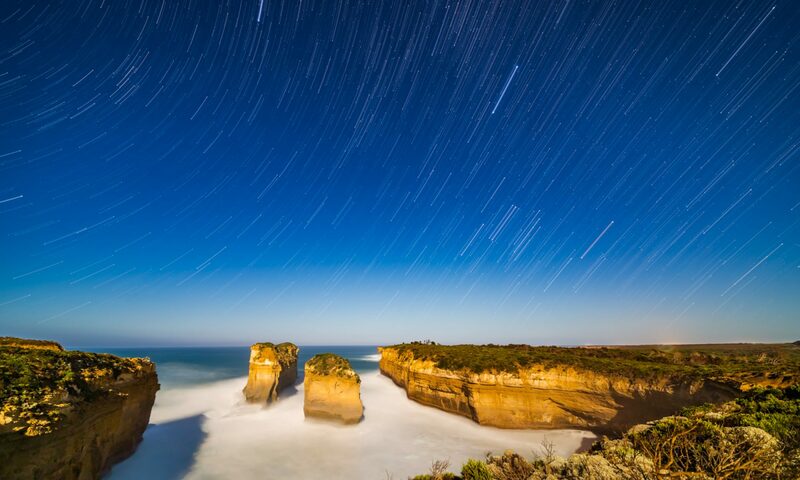 A single 13-second exposure with the 20mm lens at f/1.4 and Nikon D750 at ISO 3200. This is the view looking southeast to the strange aurora. For a time it broke up and displayed a “picket fence” formation. And it moved! Just what these isolated arcs are is a mystery. They have been called “proton arcs,” under the assumption they are caused by incoming protons, not electrons. But while there are such things as proton arcs and auroras, they are diffuse and invisible to the eye and camera in normal visible light. So these features are not proton arcs. 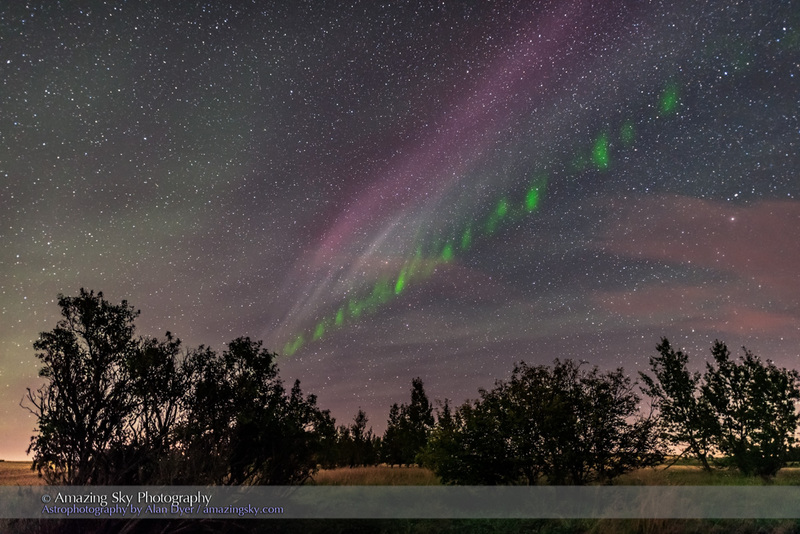 Nevertheless, these odd arcs are not like the usual auroral curtains, and likely have a different origin. But just what is still the object of research. Images by amateur astronomers such as these can help in the study.